There’s a loud splash, and a student is swallowed by the foaming rapids. Seconds later her helmeted head bobs to the surface, then her whole body, clad in a life jacket and wetsuit and shoes, appears. She’s floating flat on her back like a board with feet facing down river, just like she had been taught. Moments later a small water bottle sized bag shoots past the swimmer from the rocks on shore. It’s trailing a rope that drapes across the swimmer’s body. She seizes hold of the rope with both hands, positioning it over her shoulder – the one furthest from where the rope came from – and swings along a graceful arc into a calm part of the river. The two sisters are beaming. 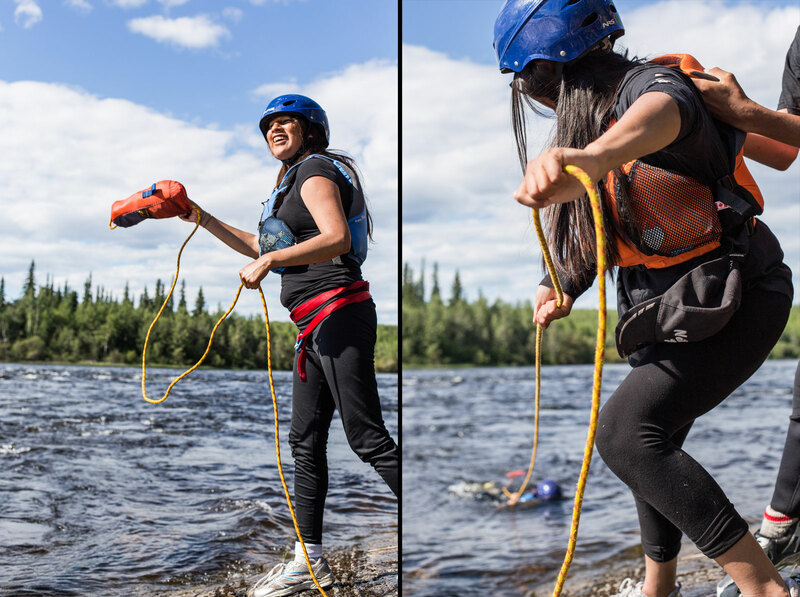 They’re from Webequie, Ont., a First Nation community of around 1000 people located roughly 500 kilometres north of Thunder Bay, Ont., and have just earned their White Water Rescue level 1 certification from Boreal River Rescue as well as made significant progress towards earning an Ontario Grade 12 course credit. 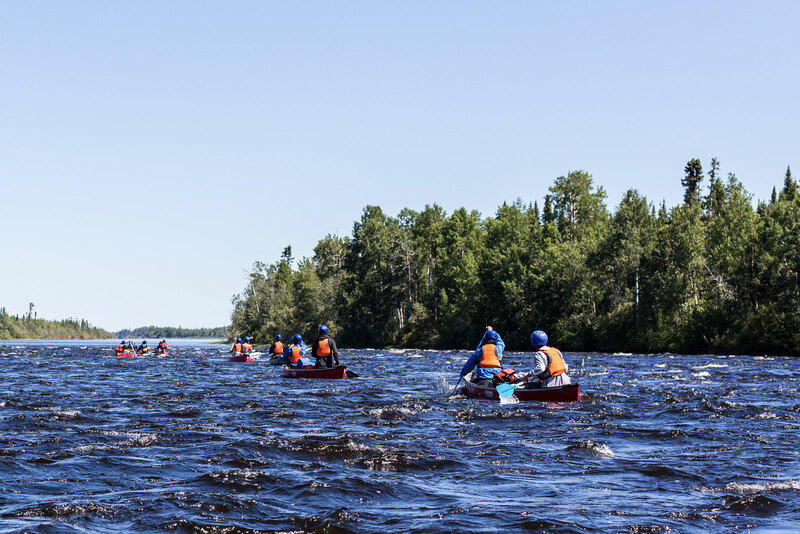 The 11 students walk back to their canoes and, with teenaged efficiency, follow instructions while the four guides, Miller, Jody Mitchell, me, and Alex Aggamaway, a local guide from Marten Falls First Nation, urge them to hurry. It’s 5:30 and though the sun sets closer to 10:00, the bugs will soon be out. 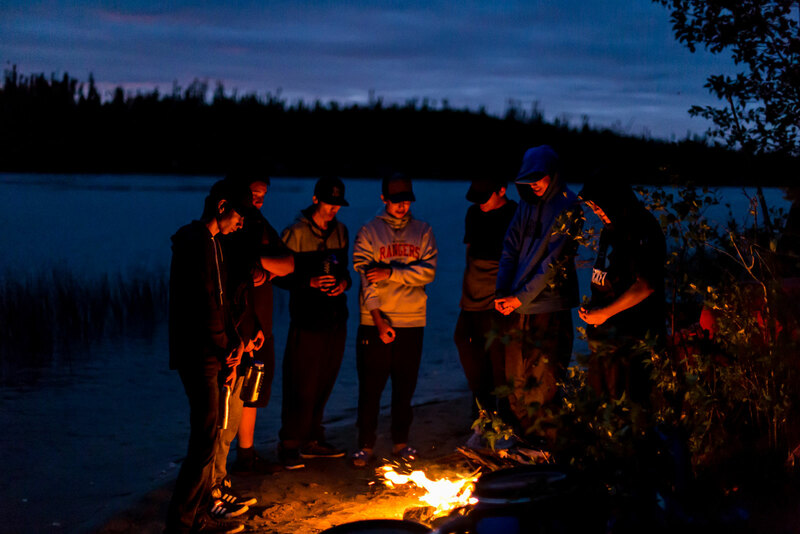 The group is the Matawa Learning Centre’s Winisk River Expedition, a Grade 12 experiential education course that followed a roughly 130 kilometre traditional First Nation’s canoe route from Nabinamik to Webequie. The course, which was the first of its kind in the area, was funded by Indigenous and Northern Affairs Canada and delivered by the Matawa Learning Centre, a school for students from the remote Matawa communities in Northern Ontario. The expedition began in Nibinamik, about 500 kilometres north of Thunder Bay on July 20. After a day spent organizing equipment the group gathered on ‘grandmother point’ where the expedition was blessed by elders and members were given fistfuls of tobacco. We were told to hold it in our left hands and then asked to sprinkle it on land or in the water as offerings to protect the community and the expedition. The ceremony ended with a healing walk around the 200-person community, which has been directly affected by the recent spate of suicides in Northern Ontario First Nations. The challenges facing Nibinamik are not new to the students, two of whom are from Nibinamik while the rest come from Eabametoong, Marten Falls and Webequie, all communities affected by the crisis. “It’s a difficult time for many of the communities up here, so beyond the course I hope this was also a chance for students to get away and just have some fun while remaining on the land that is their traditional home,” says Miller. The following morning the expeditioners slid from the muddy riverbank and into the Winisk’s current, following the centuries old route through the glacier rasped landscape of large lakes and the brief but swift rapids connecting them. “Here” was the damp start to an overgrown one-kilometre long portage around large rapids. Tents needed to be shoehorned into spaces between spruce, birch and poplar shoots, and the clouds of mosquitos and blackflies feasted until we were safely enclosed in tents. Miller, long blonde hair barely controlled by a red truckers cap, smiles through his thick beard at the students’ groans. Outdoor education is about resilience and grit as much as curriculum he tells me after. And adapt the students did. By the time the rain struck on the third day there were no groans. Students, waterproofed by rain gear provided by the program, paddled 30-kilometres without a complaint. 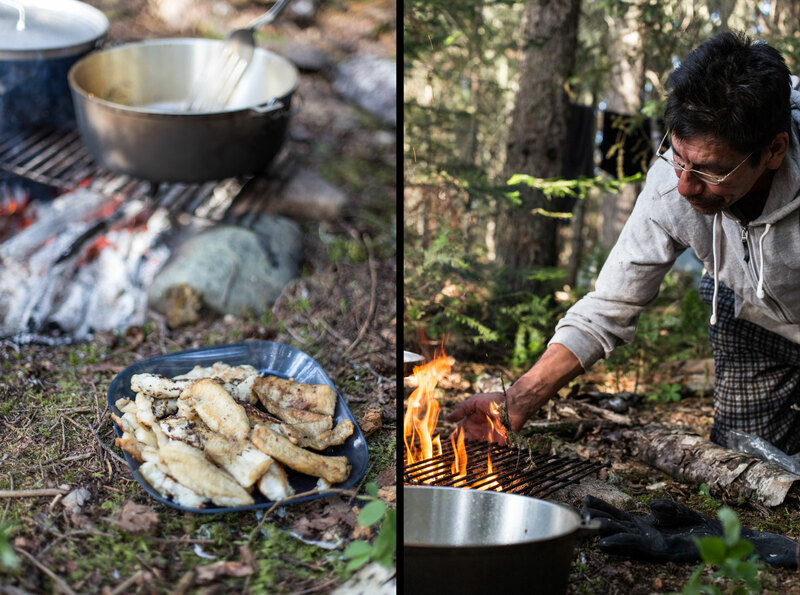 They caught walleye to supplement meals, and taught us about how to prepare bannock and the meaning of the bald eagle that briefly joined the group each day and seemed to be guiding us along the twisting river. We spent nights on narrow soft beaches that betrayed signs of moose and bears unaccustomed to having people in such remote areas. And one night after the white-water training, we camped perched atop a small rocky island reminiscent of the type of sites reserved months in advance in popular southern parks such as Algonquin or Killarney. Still, despite thriving in the outdoors for eight nights, feasting on walleye and bannock as well as the excellent dehydrated meals, there were cheers when we finally rounded an island in Winisk Lake and spotted our destination, Webequie. As we neared the community, which is nestled in the heart of a long narrow island, we saw flags at half-mast. With reconnected phones, the group was inundated by word of what they had missed. Some positive, a missing uncle had been found, but others tragic or worrying: a teen had taken his life in Marten Falls, a parent is sick. The flag at half-mast was for an elder who died of natural causes, but it was still a sobering reminder that despite the peace found on the land and the simple routines we fall into in the backcountry, life, and death, go on. A course like this isn’t an attempt to answer the issues facing First Nations in Canada, Miller says. "It is about giving students a new and fun way to earn high school credits while teaching them useful skills they can use around their home communities which are all on major rivers or lakes. It’s also a chance for me to learn from them. This is their land. They’re connected to it in ways I could never be. Two of the students told me their grandparents used to paddle this route. It’s an honour to be out here on their land with them." The students learned about backcountry camping, cooking (even how to bake a cake over an open fire) and safety. They earned certifications in basic white water rescue and canoeing. They worked on leadership skills, and earned a high school credit to boot. But when it was time for goodbyes on the dusty gravel runway in Webequie 11 days after the course had started, it was clear the adventure had been about more than certifications and school. The course was about connecting to the land and, crucially, to each other.